Next Event: Sunday, March 24th! Whatever your experience & comfort levels in the mountains, winter hiking can be an exciting way to get some fresh air, exercise, take beautiful pictures and spend time with friends and family while exploring the peaceful snow-covered wild around us. Whatever your motivation come join us on Sunday, March 24th! We have chosen a trail that will be accessible to anyone, and still gives you a taste of the mountains. Rawson Lake is a classic Rockies snowshoe trail; travelling around Upper Kananaskis Lake , through beautiful snow-covered trees and ending in a peaceful clearing and alpine lake. Please note: trail choice may change depending on conditions. We will be assessing snowfall and temperature as we approach the day of the hike, and make a final decisions based on safety and overall experience. One of the main reasons that many people stay out of the mountains is this exact issue: what do I need to own, what do I need to bring in order to be safe and enjoy being outside in the winter!? Adventure gear is intimidating and expensive! But, don't let the gear stop you! With a little bit of planning, you will have more fun, go further, play longer and most importantly, feel better when you get outside! If you are looking at snowshoes, I suggest looking for a shoe with an "ascension bar" which will make a huge difference on uphill/steep sections! Poles are optional, but can help relieve pressure from your knees - especially on the downhill sections! Bring a small backpack if you have one! BRING WATER! You can carry a cold water bottle or a hot thermos - or both, but bring water! If you bring a camelbak (or any kind of hydration system), I would make sure the hose is on the inside of your pack so that it does not freeze while we walk. Snacks! Lightweight snacks like nuts, meat, cheese, or granola/power bars are great! An extra warm layer (if you can fit it) and/or an extra waterproof or wind layer (if you don't want to wear it the whole time). If you have a small first aid kit, feel free to bring it along! Camera or cell phone (if your phone dies when it gets cold, consider bringing a pocket charger to reboot your phone/camera). Leave an extra pair of socks in the car if you want to be able to get your feet into some warm, dry footwear when we get back! Let's start with the most important rule - absolutely no cotton! None, nada, zip, zero, zilch. Why not cotton? My fluffy pajama pants are so warm and cozy!? Great, thanks Jess, so now I can't wear my cotton socks or my comfy hoodie, so what do I wear? Think layers! Start at your base, then a mid-layer, and then an outer layer. Having layers allows you to add things on, and take things off as you get hot on the trail, or cool down at the summit. Shoes: I love waterproof shoes in winter, but that is your call! Socks: one more time (just for kicks) - no cotton socks! But, another common mistake is to wear two or three pairs of socks thinking that will keep your feet warmer and it WONT! Your foot will heat the air trapped in your shoe outside your sock. If, however, you wear several layers of socks, then there is no air for your foot to heat. PLUS, the socks are so tight, you can often cut off the circulation to your feet which is vital in cold weather hiking. Get a good pair of socks, it's worth the money! That about wraps it up, our team is excited for a beautiful weekend adventure with you all! 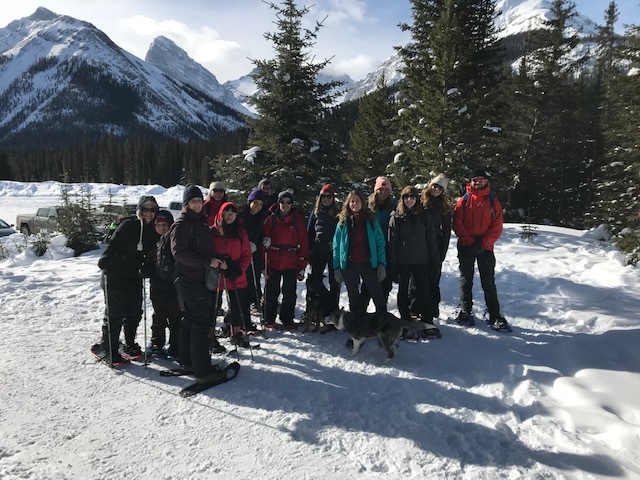 2018 Snowshoe trek with The Commons, 80/20 Hub, Play City and a crew of adventurers!